The top pick in the NFL Draft always brings lofty expectations to fans of dismal teams. How have the last 5 top-picks fared? Let’s take a look. 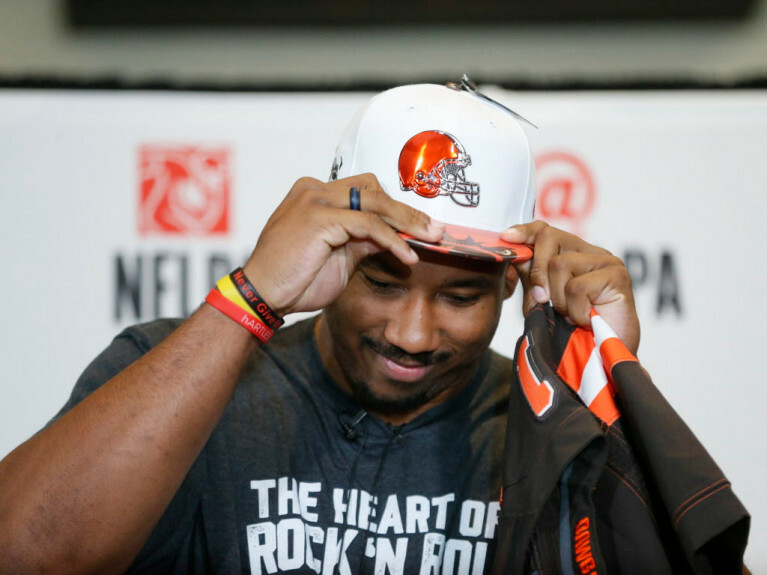 2017: Myles Garrett, Cleveland Browns, DE – Garrett collected 7 sacks and forced 1 fumble in his rookie season. He also earned PFWA All-Rookie Team honors. The Browns, however, lost every single game. Despite a fine rookie campaign, the Browns could have started a nine-month old puppy at defensive end and still had the same 0-16 record. 2016: Jared Goff, Los Angeles Rams, QB – Goff had a terrible rookie season, making many question whether the Rams made a huge mistake in trading the farm to draft him. Goff’s second year, however, was a complete reversal of fortune. He won 11 of his 15 starts, led the Rams to the playoffs, and made the Pro Bowl. He also led the NFL in Yards per Completion. 2015: Jameis Winston, Tampa Bay Buccaneers, QB – Winston has put up some impressive stats. Six rushing touchdowns his rookie year, 28 passing touchdowns the next, and he’s thrown for at least 3,500 yards each season. Those stats haven’t equated wins, and he’s tallied more off-field behavioral investigations than on-field playoff appearances. 2014: Jadeveon Clowney, Houston Texans, DE – Clowney struggled with injuries early on. 2017 was the first time he appeared in all of the Texans’ 16 games, although he was named All-Pro the previous season. Clowney originally signed a four-year contract, and is now seeking an enormous contract extension. Both Clowney and the Texans reportedly want to stay together, so it’s just a matter of ponying up what could be the largest non-quarterback contract in history. 2013: Eric Fisher, Kansas City Chiefs, OT – Remember they were either going to take Fisher or Luke Joeckel? The Chiefs landed Fisher, who has been a sturdy tackle. Although not an extraordinary player (he’s never made the Pro Bowl), he’s appeared in all 16 games for the Chiefs since 2014, starting the vast majority of them. Kansas City signed Fisher to a four-year contract extension in 2016, cementing him in their offensive line for the better part of a decade, barring injury. Joeckel, for the record, hasn’t been nearly as dependable, and has yet to find a team for the 2018 season. Three of the last five teams to draft first have made the playoffs in the past five years. Here’s to hope, Cleveland! Although Goff and Clowney could possibly lead their teams for many years to come, it’s also important to note that other players have contributed to the success of the Rams and Texans. Players like Todd Gurley and Aaron Donald factor hugely in the Rams future. The Texans will also lean on superstar J.J. Watt, the spectacular DeAndre Hopkins, and budding hero Deshaun Watson. WHO FIRST THOUGHT OF THE NFL DRAFT? Philadelphia Eagles founder and future NFL Commissioner Bert Bell came up with the idea of a draft, and his model is used in all of pro sports today. Hear how he came up with the idea, as well as many of his other ideas that affect today’s game in this episode of The Game before the Money Podcast, featuring stories from his son, Upton Bell. Experience NFL History Through The Eyes of Legends in The Game Before the Money.